Get ready Cincinnati – mark your calendars! LEGO KidsFest is coming to town! For three days in March, the Duke Energy Convention Center will be transformed into the biggest play room you’ve ever seen. 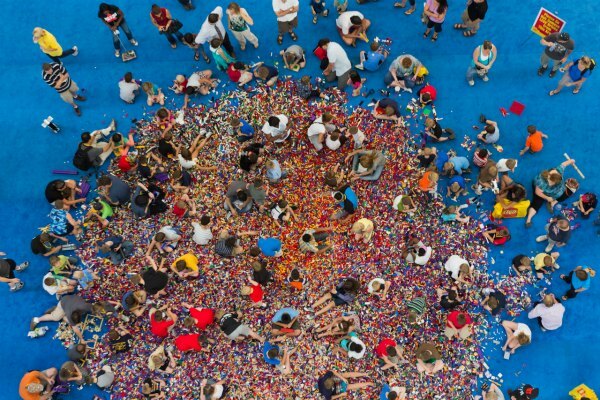 These are LEGO bricks, people, so keep those shoes on (OUCH!). There is a ton of stuff to do for kids of all shapes and sizes including a LEGO Model Gallery of 40 life-sized models made of LEGO bricks (move over Madame Tussauds! ), race ramps where you can build your own car and take on family and friends to see whose got the need for speed; play areas for all of LEGO’s amazing products and much more. LEGO Master Builders will be on hand to give live demonstrations of inspiration. LEGO have been a part of childhoods worldwide since 1932 and over 400 BILLION LEGO bricks have been produced since. Did you know that LEGO started in Denmark and the name is derived from the Danish words “leg godt” which means play well. Thanks Wikipedia. And contrary to popular belief, LEGO has absolutely nothing to do with EGGOS. Now that you’ve been schooled, here’s what you need to know to get your LEGO on – KidsFest begins on Friday, March 23rd and runs through Sunday, March 25th. There are five different sessions (each session is identical to the others). You can purchase tickets for each session at www.LEGOKidsFest.com. And the wonderful folks at LEGO are offering a discount to Family Friendly Cincinnati readers! Use the discount code starting February 17th thru March 2nd and receive $2 off each ticket. The code is: FamilyFriendly12, remember – it won’t be valid until 2/17! Tell us what you’d build if you had the time, talent and unlimited LEGO bricks at your disposal. Visit LEGO KidsFest for some inspiration. You have until February 23rd at HIGH NOON to enter! Good luck LEGO FANS! Disclosure: Tickets to LEGO KidsFest were provided to Family Friendly Cincinnati for their writers and to giveaway through the site. Pick me! I’ve been playing with legos since I was a child and I am 30 now. Legos never get old. My 22 month son loves them already. My son, age 9, would LOVE to win! He would be elated to be able to take his 8-year old best friend to join in the fun! My two boys, ages 9 and 6 LOVE LEGOS!! My 9 year old put together a 863 piece kit in 2 days!! Fun contest! Liked the page and we would build a giant Princess castle (with a pool)! My son turns 7 a few days after the Kids Fest and is having a LEGO birthday party!! I ‘like’ the FFC page too! I have already ‘liked the LEGO Kids Fest facebook page! My kids are 5 and 6 they would love it.They have just recently discovered them, and I liked your fb page. Hmmmmm….I would build a lego sorter machine that would put all the lego pieces back into their original kits so the kids could build them again with all the right pieces! I just “liked” the Legofest FB page. My boys love to play the Lego Ninjago games. All my kids would love it, but especially my two boys ages 4 years (will be 5 on March 25…LEGO fest weekend) and age 10 years. Would be a great birthday celebration! Already a subscriber to FFC! Love it! I already subscribe to Family Friendly Cincinnati newsletter. I would build an automatic laundry folder! My kids would play ANY of the games on LEGO.com. I “liked” LEGO KidsFest page. I would love to have a lego playroom with the big green mats on the walls to build on. My son will like the Quest for R2-D2. My 9 year old son and his best friend would absolutely love to go! They LOVE their Legos! I Liked the LEGO KidsFest’s Facebook page. I’d build a “Drama-Free Room” if I could. Just our family, some fun foods, and lots of snuggles–not outside drama, no evening news, no nothing…just the love of my family and abounding happiness (if even just for a few moments of bliss). We would build LEGO vehicles…they are my son’s favorite thing to make! Our 6 & 8 year old girls would go BONKERS at Lego KidsFest!!! I liked the LEGO KidsFest page. I’d build a whole city from Lego’s if I had time. My nephew would love to play the Lego Grand Pix game! My Nephew would love the game Herofactory Breakout. I’d love to take my Nephew Paxton to this…he’s 3 and would love it! I would build a child size castle that all of my kids could enjoy. If we had unlimited time, talent and Legos, we’d build a playhouse in the backyard. Ditto on the Herofactory Breakout! My son likes Lego Grand Prix game. My kids are 3, 5 and 6. They would love Lego Kids Fest!! I liked the Lego KidsFest Facebook page! My son and his nephew are both 7 and would love to go to LegoFest. My son would probably like the game Herofactory Breakout. I would build a tree house in our yard! Our kids are 5 & 6 and would TOTALLY flip out if we won these tickets! I have two boys, ages 10 and 5, who LOVE Legos!! i subscribed to the Family Friendly newsletter! I would build a lifesize home with unlimited lego bricks or a playhouse for my kids! We would build a scale town. My son would like Space Launch game on legos games. My boys like to play the Lego Grand Prix game. My kids would absolutely love this. They are 7 and twins are 4. All of my kids would flip out over this, they are 11, 8, 5, and 4. I subscribe to the Family Friendly Newsletter. I liked the Lego Kids Fest facebook page. I recently subscribed to the Family Friendly Newsletter. I “liked” Lego Kidsfest page on Facebook. What an awesome page! My 10 year old LOVES playing Legos! He spends hours making projects! He would be over the moon to go to this event! I liked the Lego Kids Fest FB page! My 4 year old is so excited about Lego Fest! He will flip out! We liked Lego gran prix! If unlimited legos/talents, we’d make our family vehicle out of legos. I teach a little one who would LOVE to go to this event!! His mom and he would FLIP over tickets to this wonderful event. 7, 5, and 4 year old would LOVE to go! Liked the Lego KidsFest page! I would build Cinderella’s Castle! I liked Lego KidsFest on Facebook! I like FFC & Lego Kids Fest on facebook. My son loves to play the kingdom games online and he also likes pirates! My 3 year old would love to go to Lego Kids Fest! And if he could build ANYTHING will all those LEGOS at his disposal, it would probably be some kind of scene from Star Wars because those are his favorite sets, he is obsessed with the figures and loves the storm troopers.! My family would build a pirate ship if we could! My almost six year old would LOVE to beanle to go to this! I would build a lego city with the boys. Lots of building and little lego guys. 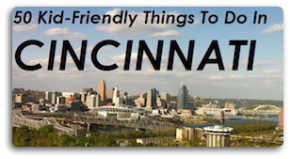 Already subscribed to the family friendly cinci newsletter! cannonball mutiny or puzzle finder. I think my son would like the game Smash Creations! I personally, would love to build a lifesize model of a car – like a Corvette or something. I subscribed to the Enewsletter awhile ago. My 5 and 6 year old boys would LOVE this surprise fun day! My son is five, daughter is two, and they would both really love to go! I liked the Lego KidsFest page on FB. My son would enjoy Catch The Crooks. His two favorite things are to play police officer or firefighter. Combine that with Legos – he’d love it! First of all I didn’t even realize Lego had games on their website, but my daughter would definitely like any of the games in the “creative” section. If we had unlimited Legos & the talent to do it in a way it wouldn’t fall apart, I’d love to build my son a Lego Bed. I’d give him a real mattress of course, but he would love it so much, I bet we’d never have bedtime battles again!!! I “liked” the Lego Kidsfest Facebook page! If we had the time, talent and unlimited legos, it be fun to build a playhouse/clubhouse. My daughter – age six, a family friend – age nine, and does my husband count as a child that would LOVE this – age 26! My son is 4 and would be in heaven! I already get the enewsletter! My boys play the Lego Ninjago games online. My kids ages 4, 7 and 10 would LOVE Kidsfest, but my 40 year old husband would love it just as much! If we had unlimited legos and talent it would be cool to do our family in front of our house. I liked Lego Kidsfest FB page! If we had all the Lego’s in the world – we would build a Castle in our familyroom with a jail. The kids love to play good guy/bad guy. What a great way to play Robinhood – if you had a Castle in your house. I have a 9 year old and a 5 year old that love Lego’s… They would love to play with tons of Lego’s. I like Lego kids feat Facebook page! My 3 year old son would love to go! My son loves to play the Lego Ninjago game! I liked Lego Kidsfest Facebook page! If I/we could build anything with Legos, I’d do a life sized image of both of my kids. They would think it’s awesome to see themselves made from Legos! I have two kids that would be so excited to go! My daughter is 4, and my son will be 9 a couple days before the event! This would be such a fun birthday treat!! I’m already subscribed to the eNewsletter! My girls love Legos! It would be awesome to win! My son likes the Lego Creator from the Lego website and he would love both the Atlantis and Pirates of the Caribbean games! (I’ll have to show him those). My boys are 11 and 9 and my daughter is 6. All three of them would be in high heaven at Lego Kidsfest! My living room already looks like a Lego Kidsfest! My eight and three year old would love to go! I have two kids who would love to go — a 6 yr-old boy and 4 yr-old girl. Although my son would probably do a backflip! Legos are his favorite thing to play with right now! I’m already subscribed to the Family Friendly Cincinnati newsletter. Thanks for all you do to keep us informed of family friendly fun! My son loves to play Ninjago Spinjitzu and the Breakout game on the LEGO website! If I had all the time, talent, and LEGOs in the world, I’d build Cincinnati, complete with King’s Island, Great American Ballpark, Paul Brown Stadium, the Museum Center Terminal, the historic downtown area, and the Ohio River. I already “like” the LEGO Kidsfest Facebook page! I have a 9-year-old boy who LIVES for LEGOs. He’s so excited the Kidsfest is coming, he’s counting the days already! I hope I win these tickets, so we could attend with the other two 9-year-olds in my son’s scout den! Already subscribed to the newsletter!!!! Our kids are 6 almost 7, 3 year old twins and a 18 month old!! My older 3 love to play legos!!! If we had all the LEGOS at our disposal each of my kids would enjoy building a huge car ramp. My kids would like LEGO Cars, Dino, and Star Wars! The kids in my crew are 10, 8, 4, and 2. Of course they are all at different stages with LEGOS, but they are enjoyed by all. Our little 5 month old is headed in that same direction. Husband & 5-year old Lego-for-Wii fans have now become master builders. Loving the Lego ideas book, really got them thinking outside their existing sets. just signed up for newsletter, didn’t even know about this website, so excited to start receiving! my 3.5 year old daugher and 6 year old son would LOVE to attend their first legofest this year! i’m an architect so i would lOVE to build all the cool lego signature architect houses lego has for adults! of the cincinnati skyline, if time and # of legos were unlimited! my kids LOVE harry potter lego game on Xbox! If we had unlimited time and Lego bricks, we’d build a replica of our house. I Like Lego KidsFest Facebook page. My kids are 3, 7, 9, 11. They LOVE Legos and would be so thrilled to win these tickets! I gave Kids Lego Fest a big LIKE on FB. Thanks! I LOVE LOVE my Family Friendly Newsletter. I have subscribed!!!!!! I would have 2 ten year old Lego Flippers in my crew. Little sis would come too but she is only 1 and has her first Duplo set already! If I had the time and the talent, I would build a miniature Findlay Market – ha – because I LOVE all the Lego food. It’s so cute!! I enjoy reading the Family Friendly Cincinnati eNewsletter. Subscribe today! My son Lucas likes to play LEGO Star Wars, Ace Assult-Jedi & Silth on-line. If I had the talent and unlimited amount of LEGO’S, I would build a functional playground. My 6yr old son Lucas and his 2yr old sister Olivia would have so much fun at the Lego kids fest. If we could build anything it would have to be a replica of our country church. My children love all the online games, but especially Ninjago. I have a like status on my Facebook page for Lego kidsfest! The ages of my children that would flip out to win are two 9 year olds and a 11 year old. Elliot would like the train game! My son Elliot is 4 1/2 and Santa brought him Legos. He would love to get these tickets! I am so glad I found this website. I have subscribed to the newsletter and am keeping my fingers crossed for a win. As far as what I would build or like to see built, I think it would be awesome to see replicas of my kiddos. They would absolutely think I was the coolest mom on earth. My son Owen is hooked on the Ninjago Legos and of course, Star Wars everything. I like Lego Kids Fest on FB. I have 3 kids, Maggie 9, Owen 7 and Eva 1. Owen is my huge Lego fan and would love Lego Kids Fest. WE will definitely be visiting this. I would build an entire amusement park out of Legos. I subscribed to the family friendly Cincinnati newsletter. I liked Lego kids feet FB page! My son is 8 and would TOTALLY flip to win tickets. 13, 9 & 2 – the one thing they all agree on – making all kinds of kingdoms – towers nad villages with Legos! My son is 9 and loves legos he has all the lego games for wii and his ds lego batman, star wars, harry potter, Indiana jones. He would be the happiest kid in the world to win tickets to this lego fun fest.He wants to build a complete lego city. My 12yr old will flip over Harry Potter legos. My 11yr old will flip over the Lego city stuff. My 9 yr old will flip over all of it–he loves Ninjago, Star Wars, City, & Hero Factory! I liked the Legofest facebook page already! I already subscribe and love this blog..
Our 6 year old son is crazy about LEGOs and would flip out to see the life sized LEGOs! 5 and 2. Love building towers and MONSTERS! My crew has two 7 year old boys that would totally flip! They have been talking about this for weeks and would love to go. My son has recently fallen in love with all things Lego. He wants to come so badly. My son is 9 and totally wants to be a Lego Engineer when he grows up! I liked the fanpage! Lego.com is our homepage and he plays NINJAGO. I would like to build a huge map of the USA with a landmark on each state that represents it. I think the cities are great at Legolands Minilands but not every state is represented. And I am subscribed!!!!! Thank you so much! We would like to build the Eiffel Tower! My kid likes to play the “Builder’s Island” game! The ages in my crew are:11,37,and 47! Subscribed to family friendly cincinnati newsletter. My kids like Battle of Hogswart. I liked legofest on facebook. My boys would scream for joy and be extremely hyper. I don’t think they will be able to sleep, but if they do then they will dream of Legos. We don’t know whether we will be able to go because of the expense, so free ticket would make dreams come true. They think this will be the next best thing to Legoland! My boys (13,10,& 7) would build a life size mansion with a bowling alley, a swimming pool, and a football dome! Both my daughter and son (7 & 8 respectively) would FLIP OUT for a chance to go to the LEGO Fest!!! They’re both amazingly imaginative, and have been BIG fans of the LEGO since early childhood (since they’re so much older now!) I don’t know what I’d build, but I’ve got a tired-mommy trick involving LEGOs that I think would be WELL worth giving the tickets to us! Try playing “Scavenger Hunt” with your little ones, and ask them to go gather “8 yellow LEGOS” or “12 green LEGOs” and so on (you, of course, are lying in your bed or on the couch as the Scavenger Hunt Master!). Then once the items have been collected (and be creative; it doesn’t HAVE to be all LEGOs — the goal here is to keep it going, right?) ask the kids to build you a structure using all the pieces and items. The one with the most creative/tallest/most colorful (or whatever) creation gets to be Scavenger Hunt Master for the next round! (and yes, that means rest time is over, but you can minimize your involvement by letting the kid who’s still in the game from losing the last round be the “overachiever” for round 2!) Enjoy! My boys love all things Ninjago! My 3 boys would LOVE this (ages 9, 8 and 6) but the price is just a bit too steep (even with the coupon, thanks!) for us to take that many people. My 9yo is already on the lego robotics team at school, so he would esp benefit from this! My twins would want to build a giant swimming pool. We currently do this only for the play people. If I won a 4 pack, my 11 year old would be more excited than my 3 year old twins. And that is hard to do. Holy Moly! My 5 year old grandson, Jack, wakes up every morning and goes to bed every evening playing with, you guessed it, his LEGO’s! His favorite things to build are Lego monster trucks and cars but if he could build a big size one, he’d go bananas! I’d absolutely LOVE to win tickets to the LEGO Kids Fest in March as his birthday is March 15, so wouldn’t that just be the BEST birthday excursion EVER for him??? You all offer the funnest things to do. Keep up the great job! My 8 year old daughter just discovered Lego for Girls. She is so good at following the directions and putting things together. Way better than I am. If we could build anything, my 6-year-old daughter and I would somehow build a giant, hollow, water-tight shark that could go in the bathtub (and float)! My little builders are 3 and 6! I love that Legos is the one toy that can bring my two kids – Zoe, 8 and Noah, 5 – together. There’s no fighting or arguing when the Legos are out! They actually work together! They cooperate with one another! It’s amazing! My boys’ dream Lego creation: A powered Lego Train that you can fit inside and actually ride! My kids love Lego Digital Designer! My kids are 10, 8, 7, and 3. My older ones have been using Lego bricks in their stop motion animation videos lately. My son is going on 7 and would love to win tickets to this event. I told him about it like a month ago and he keeps asking when it is. I also have a 4 year old daughter who loves trying to be like her brother and plays the games on the computer as well. They would love to win tickets. My kids play the cake game, train game, shop game, stack game and Builder’s Island game. They love legos. My 3 year old, Zackary would have a blast at kidsfest. Of course I subscribe to the newsletter! I would build an city with railroads, bus stops & roads for my son and a animal village for my daughter. My son already plays on Lego.com and loves the Star Wars games. I’d build something like what you see at Disney World! Once we saw a huge Woody from Toy Story. I need to check to see if there are any Lego apps. Thanks for the thought! My son would like the trains story game and my daughter would like Builders Island. I subscribe to the enewsletter already! I just “liked” the Lego FB page. My kids are 8 and 6 and HUGE Lego fanatics! Liked kids LegoFest the other day. I have a 7 yr girl who loves the Lego Friends and a 5 yr old boy who loves the City series. We have a number of buses and trains. My kids would love to play the Lego Duplo Music Game! I would build the entire Star Wars line up just to thrill my 6 year old if I had endless legos! I would build a giant airplane! That a real person could sit in! That would be fun! I like Legos Kidsfest Facebook page! Mine are 8,7, and 5! My four and six year old would FLIP OUT to say the least! My boys are 5, 3, and 1 and they all LOVE legos! My 4 year old is just starting to enjoy his Lego’s. Can’t wait until he sees ALL the possibilities!! My 3 yr old would totally flip out for this! He loves lego! My kids are 8 and 5 and would go crazy if they were able to go to this!!! My son, who is 6, has so many, but wants more to have the complete collection of Star Wars! if we had unlimited legos we would build our own version of the Death Star battle. my 7 year old son and 12 year old daughter would flip if we won! We’ve had Lego Kidsfest on our calendar since the day it was announced!!! My son, Holden, age 6, would LUV to attend and bring his cousin, Julius, age 6, from Indianapolis, to the LEGOFest!!!! My 6 year old daughter loves her Legos, especially Belville. My son has played Lego City online. We would build a Lego maze complete with a pool and playhouse at the end. I subscribed to Family Friendly Cincinnati! They would build the Death Star if they could. They keep wanting to save all their birthday money to able to afford to buy it. The Lego games online, most of the time lead to everything Lego Star Wars. I “liked” Lego KidsFest on FB too! My 4 sons, 9, 8 & twins 6, love everything Lego. Last year they were on a First Lego League Team, and the theme for First Lego League Ohio State Championship Tournament was Bio-Medical Engineering, They had to build an MRI machine out of Legos, with moving parts, in addition they also built a wheelchair and X-ray machine. They are Lego biggest fans! If I had the time, talent, and legos at my disposal, I would build a life-size 4-5 bedroom home. We could really use one! Of course, I’d have an extra room of “spare parts” so the kids could play legos without literally tearing our house apart! I think my kids would love the Lego Builder’s Island! My son will have just turned six and my daughter is seven, and they would flip out if we won tickets! I “liked” the LegoKidsFest FACEBOOK page! I think my son would really like the agents mission game. I need to show my kids all these games! My kiddos in my crew are 7, 10, and 12 years old… and they would all flip out if I won these tickets to LEGO KidsFest. I like the LEGO KidsFest’s FACEBOOK PAGE. I visited LEGO’s virtual world at http://www.LEGO.com and my kiddos would love to play Harry Potter Battle for Hogwarts. If I had the time, the pieces, and the energy, I would build the GoldenGate Bridge. I subscribed to the Family Friendly Cincinnati eNewsletter. My kiddos in my crew include: Corbyn, 10; Leonardo, 8; Nadiya, 7, Bryston, almost 1, and myself, 30 something :0. My two older boys love legos and the 8 yr. old has been saying he wants to be a lego builder when he grows up ever since 1.5 yrs ago. If I could make ANYTHING, it would be a tricked out dog house for our Boston Terrier! That would be awesome! My crew kids are my son, who is 8, and my daughter, who will be 4 by the time Lego Kids Fest comes to town. My daughter just recently took an interest in Legos and has made a ton of great creations. My son is a HUGE fan! He had a LEGO themed birthday party last year, and takes a Lego creation to art class show and tell every week! His current creation is a Lego maze for his Hex Bugs! My son would love the game “Smash Party” on http://www.LEGO.com! My son is obsessed with Lego’s! I just read about this…and I can’t wait to take him! My son is 5 and my daughter is 8 and I think they would really enjoy lego fest. They pay Lego Star Wars and Lego Harry Potter. I would built a big octopus if I had unlimited legos and time. My son is 5 and my daughter is 8 and I think they would really enjoy lego fest. My 4 year old son and 3 year old daughter would loooove to go to Lego Kids Fest! Right now, my son has really gotten into Lego Indiana Jones and my daughter is loving all the “girl” legos! My son liked SuperSonic RC for an online game at Lego but they canceled it. He now plays Ninago games online. Our whole family enjoys building Lego projects together. My kids are 3 & 5 yrs old. My kids are so excited Kids Fest is coming to Cincinnati! I have Girl/Boy age 4 twins and they would LOVE to be able to go to this enourmous event!! We would love to build our favorite vacation spot in the Lego Nation! It would be our touch on how the beach should be! My kids are going to LOVE that Lego KidsFest is FINALLY coming to our town!!!!! I have 2 boys that are Lego fanatics, ages 8 and 5.5, and they both especially love the new Ninjago sets and TV show! Can’t wait to go downtown and check this event out! I have a 12 year old and a 6 year old who are both huge Lego fans! I subscribe to the e-newsletter. Thanks! Our kids are 4 and 5 – what fun! My 6 and 4 year old LOVE legos! They would love to attend Kids Fest! My kids love LEGOS!!! They have all the city LEGOS. Right now they are playing LEGO Batman on the Wii! My stepson’s age 11 and 12 are lego maniacs and would LOVE this. I also have liked the Lego Kids Fest FB page! My son, age 9 and daughter, age 6, plus my adult son, aka husband age 39 would love to attend this event. It’s our favorite thing to play with as a family! If I had the time and talent, I would build a Legos model of our house. I would build a Lego Batman world for my son if I could:). My boys — 8,6 and 3 are all Legos maniacs!! My almost 5 year old would love this! We took my 7 year old and 1 year old to LEGO KidsFest in Cleveland last fall! It was a blast and recommend it to anyone who loves LEGOs! I have a 5 yr old girl & a 7 yr old boy that would love if I brought home tickets for this! My 5 year old loves Legos. He would be very excited to be able to go to Lego Kids Fest. My son and I build cars/trucks and buildings. Just subscribed to the newsletter! Thanks for the contest! My daughter would love the train game. I’d build an entire city — skyscrapers and all. If we had the time, talent, and unlimited Lego bricks, I’m sure my husband would want to build some sort of to-scale historical building like Westminster Abbey. I think a zoo with all of the animals or a huge working farm with everything (animals, plants, barns, tractors, etc) would be fun. I would try to build the feris wheel my brother built when we were kids. It went up to the ceiling! Already subscribe to the FCC newsletter. I hadn’t seen the games before on the Lego website, but I think my son would pick the Ninjago one. Not sure what I’d build with actual Lego’s, but if this counts – I am currently in the process of designing and sewing a Lego Quilt for my grandson — it will have Lego minifigures (Ninjago and Star Wars are his favorites) as well as Lego blocks around the border. My daughter would love this! She is 4 and loves to build things! Have never played the online Lego games, but after looking at them, I know my littlest will love the train one! We currently play the Lego Wii games and it’s a lot of fun. I wasn’t familiar with the games on Lego.com, so can’t wait to show my grandson after school today. I think he’ll pick “Builder’s Island”, but I’ll leave it up to him. My son is 5 yrs old and has been loving legos for a few years now!! He would be ecstatic if I told him we had tickets to the lego fest. He has looked through the pictures and is wanting to build a life size clone trooper!!!! I “liked” Legos Kids Fest on FaceBook. Liked the Lego FB page. My grandson will be 6 on March 1st and is a Legomaniac. I can’t imagine the look on his face if I told him we were going to Lego Kidsfest! Priceless! My 4 and 11 year old sons would love to go! They love Legos and spread them all over the house! My littlest one is excited about her upcoming birthday and would really like to play the cake game on lego.com. Subscribed to the newsletter! Thanks! My girls and I would love to build a Lego home for all the Littlest Pet shops that live at our house! “Liked” the Lego Facebook page! My three girls, aged 4, 8, and 12, love to build with Legos and would really enjoy this festival! 2 little ones ages 3 and 4 would LOVE to get some LEGO play! For myself on Pinterest someone posted a real kitchen table done with the top covered entirely in Lego bricks… something like that could be pretty cool in a kitchen with the right look if you ask me! IF I HAD THE TALENT TIME AND PATIENCE TO BUILD LEGOS I WOULD BUILD A BASKETBALL COURT B/C MY SON AND I LOVE BASKETBALL. Went to Lego.com… my Kids would love to play a lot of these games. I didn’t know this site existed! I will have to surprise them. They will be sure to enjoy Space Launch & the Toy Story themed games. I LIKED THE KIDSFEST FACEBOOK PAGE. I FOLLOW THE PAGE AND GET THE UPDATES AND COMMENTS ALL THE TIME. I HAVE A 12 YEAR OLD AND 17 YEAR OLD THAT SPEND HOURS BUILDING LEGOS ALONE AND TOGETHER. WE DID NOT HAVE A CHANCE TO GO TO THE LEGOFEST THAT WAS IN CLEVELAND BUT WE ARE PLANNING A TRIP TO CINCINNATI FOR MY YOUNGEST’S BIRTHDAY. HE IS THE BIGGER LEGO FANATIC OF THE TWO. My sons are 10 and 6 and all they do from sun up to sun down is play with their LEGO’s. They love all the games on LEGO.com and were dissapointed when LEGO universe was shut down. If we won tickets to this I don’t think my boys would ever leave. If I had an unlimited LEGO supply I would build a baseball field complete with players and fans. I get the FFC newsletter. If I had the time, talent & unlimited lego I would build a rollercoaster! I am a subsriber. My grandson is 5. He loves Legos. He likes to play the Ace Assault Star Wars online game at the website and a ton of other ones. 😉 If we had the time, I think he would love a huge star wars death star! I subscribe to Cincinnati Family Friendly newsletter! My son is turning 8 this Friday and this is what he wants to do for his birthday! He has just recently really got into the whole lego star wars thing! He would be so excited to get to do this!! Lego.com is my son’s favorite site to play games on! He loves all the games! They would build a replica of our neighborhood. I’m a fan of Lego KidsFest on FB! My son is 5 and my daughter is 2. They both love Lego and we’d love to be able to take them! We like the Lego.com games – – Ninjago, Harry Potter and Stars Wars. My girls are 10 and 7 and are crazy for Legos! I would build a lego statue of my son…he would love it! I already subscribe to the news letter. Legos are by far my children’s favorite toy! We are really looking forward to the festival! My 7 year old would love to go to this!! Jordan is 6 and Aiden is 4!! My kids, son (8) and daughter (4) are what most might call fanatics. But to me, they are just kids. Don’t all kids LOVE LEGOS? At the enormity of the legos (3 acres?!) my kids might just for once (daughter especially) be speechless! Like LegoFB. Already like FFC. If I had the time we’d build the Millenium Falcon! Love the Lego star wars games, and Harry Potter! ! I like the KidsFest page! My son is 7 and my daughter 5. They would be totally blown away by this. I think my son might even cry! He builds legos literally as soon as he wakes up till we tell him to go to school or bed. He is a lego maniac. That is all he wants for Christmas/birthdays. I don’t see it ending. He wants to work for lego sometime, I don’t doubt that he will. My 6 y.o. is going to love this! We would build the lego horseshoe casino, it’s floor won’t break! Lifesize Fresh Beat of Shout! my 3 year old son and his 3 year old cousin! – My kids are 11 & 9…they both love Legos, but I think my 9yo DD loves them far more than my 11yo DS. She was so excited when they finally came out with girl Legos!! – My daughter would like to make a life-sized version of herself out of Legos!! – We also subscribe to the FFC newsletter! My kids love all the Ninjago, Alien Quest, Harry Potter, Hero Factory and Star Wars games. My 5 year old son is really just getting into lego’s so he would be pumped! I subscribe to the newsletter and love it! Our son’s are 9 and 13. They play Lego’s everyday. Our 9yr old lives, sleeps, dreams, builds, eats (just kidding) Legos. He is Lego OCD! We would love to come to the event in Cincy! I would build a kid size Lego castle for my kids. My 5 year old son is so excited to attend!!! I showed him the pictures you have on your site and he just kept saying that looks so awesome! He has played every Lego game, but his favorite right now is Lego Harry Potter 5-7. If we had unlimited Lego supplies I know we’d be building characters from Ninjago. I “like” the Lego Kids Fest FB Page! My 3, 5, 7 and 9 year old children would go NUTS at Lego Kids Fest! My son is 7 and he would totally flip! I would build a life-sized Lego house! My five year old and three year old would LOVE to go to the lego expo! My son would love to play Lego Grand Prix! My son is turning 5 next month and would love this! My 5-year-old daughter and 2 1/2-year-old son would totally go nuts for this! I like LEGO KidsFest, I get the FFC newsletter. My daughter would probably build anything Harry Potter-related, and that Music Kingdom game looks very cool, too! I subscribe to your newsletter–DUH. My five-year-old would flip for these tickets. We play the Shop Play Game! I already like Legofest FB page! My 3 year old and almost 1 year old would love this! The kids and I would build the city of Cincinnati. My kids are 10 & 12. They would completely flip b/c they love Legos. We went to the Lego store in Chicago and had a blast! attending this in Cincinnati would be wonderful for them!!! We have a 9, 7, and 4 year old that would love to head to Lego Kids Fest! I LIKED the KidsFest fb page! And I liked their fb page. My kids (agest 8 & 5) would love this! My son dreams of building an amusement park out of Legos! My 7 year old son and 5 year old daughter would love to go to this! I would build a house with a garden and a family on a picnic. I’d love to build a model of Union Terminal! I’m sure my daughter would love the Lego Creator Builder’s Island game! Well the boys use to love Lego Universe but now that it’s gone they love to play any game that coincides with Lego City. My sons 9 and 6 are Lego addicts and I really want to take them. Not only take but I want to surprise them with it. My daughter is nine, and would be so excited! My 6 year old daughter and 8 year old niece would completely flip out if we won these tickets and could go to the fest!